Saplings with large, shiny, deeply creased leaves grow on an old logging road just north of Arcata. This is cascara (Frangula purshiana), another plant of Pacific Northwest affiliation, which can be either a shrub or a small tree up to 30 feet tall. Most of its beauty is in its smooth gray bark and shiny leaves. The spring clusters of greenish-yellow flowers are unobtrusive, but the fruits are also striking–small purplish-black berries that look similar to those of its cousin, coffeeberry. 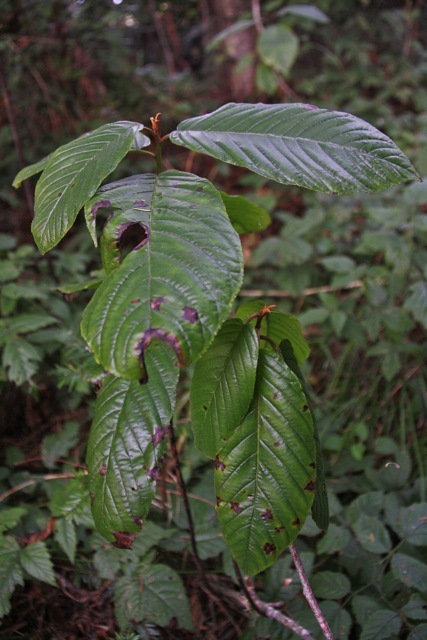 Native tribes used cascara bark as a laxative, and settlers found it so effective that in the late 1800s it became the base of a commercial pharmaceutical that was exported to the rest of the US and Europe. For a time it was so heavily harvested that it was almost exterminated from some areas–some say that it still hasn’t fully recovered. In fact, according to Wikipedia (which I hate to quote, but here goes) even in 1999 cascara made up more than 20% of the national laxative market in the U.S., with a total estimated value of $400 million and the bark alone being worth $100 million. Cascara grows from BC to Northern California. It stops short of the Bay Area, but it is found in Sonoma county where it’s been reported from Salt Point, Fort Ross and other places.